United Airlines has just unveiled its latest safety video, Safety is Global III, a well-done safety video that is light on humor but nicely showcases United’s international route map. The video takes place in locales around the world including Rio during Carnival (or perhaps that is New Orleans? ), Germany, Iceland, Australia and India. The German scene takes place in Munich at the famous Hofbräuhaus (though it could just as easily have been filmed in Las Vegas). The Iceland scene…demonstrating the beautiful Northern Lights…is my favorite. It again reminds me of how much I want to return to Iceland this winter. Such a shame United’s new service to Iceland will only be during the summer, but I am still impressed that the new safety video already showcases this new United destination. The India begins at Taj Mahal, but shifts to what looks like Jaipur. Don’t miss the cameo by Oscar Munoz either! 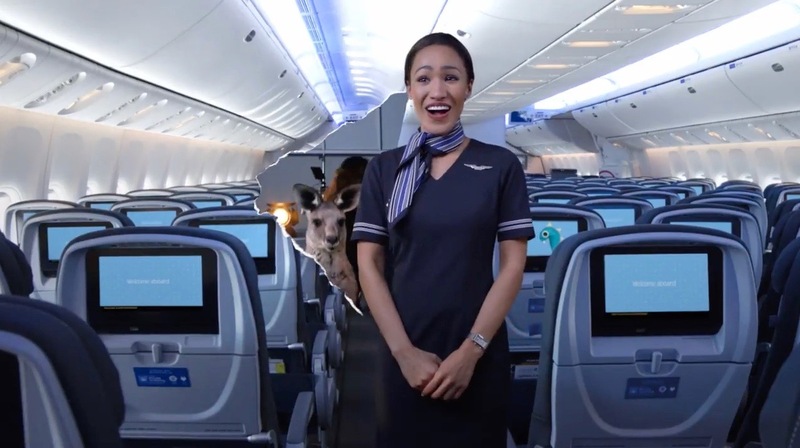 I’d point to another cameo…our kangaroo from Safety is Global I…as the one clear bit of humor. I think we were all bored of Safety is Global II and the olympics safety video, so this is a welcome update. Good for United for planning out this video well and nicely capturing the diversity of its employees and international route map. Interestingly, there is no mention of United Polaris. Perhaps United realized it is best not to lead people on when it will take several years for Polaris to fully roll out. Polaris will doubtless get a mention on the real Polaris configured planes, plus the 3-class 763 and 772. Those (real Polaris and Global First) require the shoulder strap attached to the seat belt. So it’ll get a mention in the extra seconds on those variants. I like the video too. A little less humerous (aka less cheesy) than the last two but very well produced and attention grabbing. And hence the safety aspect stands out more too. Good point on the shoulder straps. Why are the life vests are never actually inflated on these safety videos? It’s understandable why they don’t do it during live safety briefs but the video would more enlightening and much more helpful and remove some of the “surprise factor” if they showed the vest being inflated. Did Oscar say “denada,” as in the Spanish for “you’re welcome?” Just asking because I want to make sure I heard correctly. He did, which itself can be seen as a political statement. Sit on a flight and listen to that safety video 50 to 100 times a year and it gets old pretty damn quick. Annyoing as hell.